Sheila wedded earls and barons, befriended literary figures and movie stars, bedded a future king, was feted by London and New York society for forty years and when she died was a Russian princess. Vivacious, confident and striking, Sheila Chisholm met her first husband, Francis Edward Scudamore St Clair-Erskine, a first lieutenant and son of the 5th Earl of Rosslyn, when she went to Egypt during the Great War to nurse her brother. Arriving in London as a young married woman, the world was at her feet - and she enjoyed it immensely. Edward, Prince of Wales, called her 'a divine woman' and his brother, Bertie, the future George VI of England (Queen Elizabeth's father), was especially close to her. She subsequently became Lady Milbanke and ended her days as Princess Dimitri of Russia. Sheila had torrid love affairs with Rudolph Valentino and Prince Obolensky of Russia and among her friends were Evelyn Waugh, Lord Beaverbrook and Wallis Simpson. An extraordinary woman unknown to most Australians, Sheila is a spellbinding story of a unique time and a place and an utterly fascinating life. "A marvellously entertaining story that at times resembles a glossy television period drama." --"Express"
"Amarvellously entertaining story that at times resembles a glossy television period drama." Express"
Born on an Australian sheep station, Sheila Chisholm (1895-1969) wedded earls and barons, befriended literary figures and movie stars, and died a Russian princess. 4.0 out of 5 starsLife as it was for the rich! Certainly a life story of how "the other half" lived - maybe some still do live like this. Everyone seemed to be swapping partners, all relationships seemed to be very carefree. And the social activities - like a dream. So much money for those who had it. Involvement with the Royal Family members a bit of an eye opener! It was not the sort of life that most of us live these days, that's for sure. Not much parenting of the offspring of the rich and famous! But of course they wouldn't have time with all their social activities! But I quite enjoyed the book - it was well written. Can't say that for all the books one buys these days. Robert Wainwright has deftly captured the life of an Australian girl who travels to "The Old Country" and entrenches herself into the high flying socialite's world in England. Making friends in high places, including royalty, she becomes the darling of the Bright Young Things set. Wainright's research has been methodical and as precise as he can get with the information gathered, which includes Sheila's unpublished memoirs and the many, many references to Sheila's dalliances and capers with the the BYTs in the press. I thoroughly enjoyed this book. Highly recommended. Very interesting story-Sheila was ever the socialite of her times. Enjoyable reading. I also recommend 'A Scandalous Life' x Mary S Lovell. Biography of Jane Digby. i had never heard of her,certainly an good look into the early lives of the royal family,not so innocent .she certainly was a good time girl. 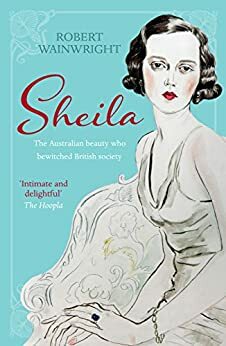 Fascinating insight into the lives of the rich and famous told through letters, diaries and personal memoirs kept by Sheila, all of which are compiled into a story that is well researched and very absorbing. 5.0 out of 5 starsSuch an interesting person! I'm really enjoying this book so far. I had never heard of her, but saw this book in my local library. At the time I borrowed it I was really busy and didn't get to read much of it before it had to be returned, but what I did read was so good that I ended up buying it as an ebook. Easy writing style, a good one to curl up with on a cold day. I was unable to put down this intriguing biography about an unknown but fascinating life led during a momentous period in world history.